Antigua community organizations: Cushion Club. 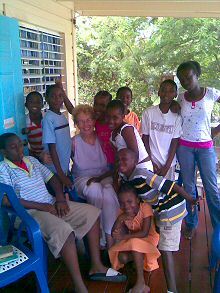 Since 1997, the Cushion Club has engaged the children of Antigua and Barbuda in fun reading activities. The voluntary club meets every Saturday between 10:30 a.m. and 12 noon during the regular school year. It attracts young people of all ages and reading levels to the meeting place – currently the Best of Books on Friars Hill Road. We’ve moved around a bit over the years (Woods Park, the Museum, the Senior Centre) but this brings us full circle as the Club was started at First Editions on Friars Hill Road; the name growing out of the fact that the children were required to bring only a Cushion when they came. The Best of Books has been a longtime patron of the Club. Longest serving volunteer is Cedric Holder who received a National Youth Award for Lifetime Service and remains committed to the Club as chief volunteer. It was through his initiative that the Club became involved with Buckleys Primary to which he contributes a Humanities prize for outstanding students. 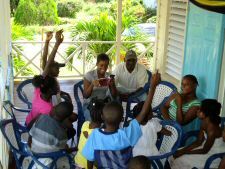 The Club, via Holder, has also been a regular supporter of the Wadadli Youth Pen Prize, a project run by long time volunteer Joanne C. Hillhouse. On Saturdays, during regular Club sessions, children – the numbers of which vary week to week – are read to and practice their own reading, in addition to engaging in comprehension, spelling, and social studies exercises. There are hand games and mini-quizzes, and all around good word play and reading fun. While we hope to improve children’s reading skills, we are not experts in this area and there is no formal testing. Simply put, we love to read and we feel committed to helping to develop in young Antiguans an appreciation for the literary arts and for all that reading can bring to various areas of their lives. Always, we want to make sure that while learning they have a good time. 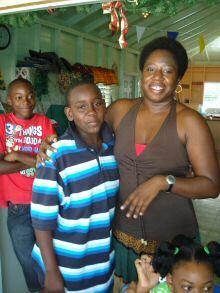 We have guest readers in, go on field trips, and even engage in exchanges with other reading clubs. There is no fee, and no registration is necessary. • A steady supply of fun and interesting, age appropriate books of any genre. • Word games – Scrabble, Upwords, Boggle, Apple to Apple etc. • Volunteers – every Saturday, two Saturdays a month; even a commitment one Saturday per month would do. 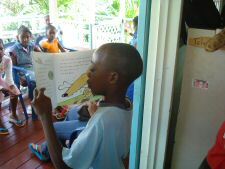 We encourage you to give what you can and support our efforts to help Antigua’s children fall in love with stories, and maybe even grow to tell stories of their own. Need to know more, contact us at cushionclub@yahoo.com or feel free to stop by Best of Books on Saturdays.